Adi Sankaracharya was born in kaladi in 8th century when Hinduism had few problems. The Shiva worshippers , vishnu worshippers, ganesha worshippers , has misunderstandings . It is Sankaracharya who organized Hinduism and helped in its upliftment. Once Sankaracharya was going to few houses to take bhiksha. He came across a hut and asked for bhiksha. ( food ). The women inside the house was embarrassed as a saint has come to her house for food but she is so poor that nothing was available in her house. She searched all the places and finally found a old Amla fruit (Emblic myrobalan) ( nelli kani in tamil ). The poor women was feeling shy to give only this little amla fruit to Sankaracharya but she has immense devotion and dont want to send the saint who came to her house empty handed. She offered the amla fruit in the bowl to Lord Sankaracharya. Sankaracharya realized the womens devotion irrespective of being poor. He immediately started singing twenty one slokas praising Goddess Mahalakshmi , praying her to bless the poor women by driving her poverty and grant her riches. 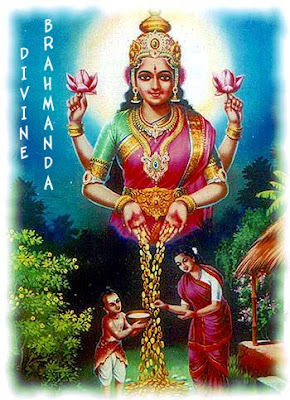 Mahalakshmi replied that the lady has not done any good deeds ( helping others in charity ) in her previous birth. so she doesn't deserve riches and is destined to suffer in poverty. Adi sankaraya accepted it but said though the poor lady din't do any good deeds in previous birth, in this birth, she has such a kind heart that irrespective of being poor, she gave this little amla fruit to him and this good deed alone is enough to bless her with all prosperity. Listening to Sankaracharya's beautiful stotra and his arguement that the poor women must be blessed for her good deed in this birth ( offering of little amla fruit ), Mahalakshmi was moved. Friends, here comes the greatness of this Goddess. She really is for devotion and purity of heart. If we always involve in good deeds , always chanting Gods name, we will surely be blessed by Mahalakshmi. As Sanakaracharya was singing Kanakadhara stotram, Mahalakshmi showered Golden amla fruit like rain infront of the poor womens hut. Imagine, rain of golden fruit showering from sky . How beautiful is this story friends . How beautiful is the devotion of the poor lady and how great is the saint Adi Sankaraya who sang in praise of Mahalakshmi and beyond all this How graceful is this Goddess Mahalakshmi. Adi Sankaya has sung this "Kanakadhara stotra" for welfare of everyone who is suffering their past karma and suffering in poverty.